Our nursery idea was to create a space for Saxon that didn’t completely spell B-A-B-Y, a room that she wouldn’t outgrow right away. Wow. What a difficult task it was. Especially considering most baby furniture/decor looks like it was designed by a twelve year old using her "Groovy Barbie Furniture Designer" CD or her "It’s gotta be Pooh" templates. The modern furniture items are the Aerial Crib and Platform Dresser both by NurseryWorks. We tried no less than 10 different paint colors - and about 5 or 6 different pinks. We even had the room professionally painted, still didn't like it and had the painter come back again the next day to apply the winning paint - French Pink by Ralph Lauren Paint. The rug is the Rosalie Area Rug by Haba. 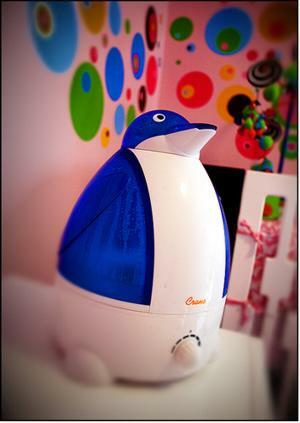 The Penguin Humidifier by Crane is a cool mist humidifier. It works by making water vapor through a rapidly turning disk within the water of the humidifier. Because the vapor from the machine is not heated, there is no risk of burning the child should the water spill or if she places her face close to where the vapor escapes. And that's about it - what do you think? LOVE this nursery! Where did you find your crib sheets/bumper? I cant decide what I want to put with the vibrant walls. My husband and I are hoping to adopt a baby girl soon, and I love this dot to dot design. It totally screams my style. I want to try a slightly darker color wall. Thanks for the awesome inspiration. I love your nursery. I was just wondering what color window treatments you used. Where did you get the crib bedding? 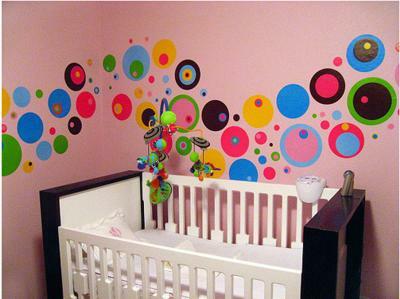 Did you use only one set of dotty wall art stickers? The crib is by Nurseryworks - you can buy it here. Where did the mobile come from?? Thanks for sharing all the detail Chris. I love the bright colors and funky furniture. Nurseryworks is always a big hit! P.S. Saxon is such a gorgeous baby!